The Rule and life of the Friars Minor is this: to observe the Holy Gospel of Our Lord Jesus Christ by living in obedience, without anything of one’s own, and in chastity. Brother Francis promises obedience and reverence to our Lord Pope Honorius and his successors canonically elected and to the Roman Church. Let the other brothers be bound to obey Brother Francis and his successors. and How They Should be Received. If there are any who wish to accept this life and come to our brothers, let them send them to their provincial ministers, to whom alone and to no others permission is granted to receive the brothers. Let the ministers examine them carefully concerning the Catholic faith and the sacraments of the Church. If they believe all these things, will faithfully profess them, and steadfastly observe them to the end; and if they have no wives, or if they have wives who have already taken a vow of continence and are of such an age that suspicion cannot be raised about them, and who have already entered a monastery or have given their husbands permission by the authority of the bishop of the diocese, let the ministers speak to them the words of the holy Gospel that they go and sell all they have and take care to give it to the poor (cf. Mt 19:21/ /Mk 10:21/ /Lk 18:22). If they cannot do this, let their good will suffice. Let the brothers and the minister be careful not to interfere with their temporal goods that they may dispose of their belongings as the Lord inspires them. If, however, counsel is sought, the minister may send them to some God-fearing persons according to whose advice their goods may be distributed to the poor. Then they may be given the clothes of probation, namely, two tunics without a hood, a cord, short trousers, and a little cape reaching to the cord, unless, at times, it seems good to these same ministers, before God, to act otherwise. When the year of probation has come to an end, let them be received to obedience promising to observe always this Rule and Life. On no account will it be lawful for them to leave this Order, according to the decree of our Lord the Pope, for, according to the Gospel: no one who puts a hand to the plow and looks to what was left behind is fit for the kingdom of God (Lk 9:62). Let those who have already promised obedience have one tunic with a hood and another, if they wish, without a hood. And those who are compelled by necessity may wear shoes. Let all the brothers wear poor clothes and they may mend them with pieces of sackcloth or other material with the blessing of God. I admonish and exhort them not to look down upon or judge those whom they see dressed in soft and fine clothes and enjoying the choisest food and drink, but rather let everyone judge and look down upon himself. Let the clerical brothers recite the Divine Office according to the rite of the holy Roman Church excepting the psalter, for which reason they may have breviaries. The lay brothers, however, may say twenty-four Our Father’s for Matins, and five for Lauds; seven for each of the Hours of Prime, Terce, Sext, and None, twelve for Vespers, and seven for Compline. Let them pray for the dead. Let them fast from the feast of All Saints until the Lord’s Nativity. May those be blessed by the Lord who fast voluntarily during that holy Lent that begins at the Epiphany and lasts during the forty days which our Lord consecrated by His own fast (cf. Mt 4:2; Lk 4:2); but those who do not wish to keep it will not be obliged. Let them fast, however, until the Lord’s Resurrection. At other times let them not be bound to fast except on Fridays. During a time of manifest necessity, however, let not the brothers be bound by corporal fast. I counsel, admonish and exhort my brothers in the Lord Jesus Christ not to quarrel or dispute or judge others when they go about in the world (cf. 2 Tim 2:14); but let them them be meek, peaceful, modest, gentle, and humble, speaking courteously to everyone, as is becoming. They should not ride horseback unless they are compelled by manifest necessity or infirmity. Into whatever house they enter, let them first say: “Peace be to this house!” (cf. Lk 10:5). According to the holy Gospel, let them eat whatever food is set before them (cf. Lk 10:8). I strictly command all my brothers not to receive coins or money in any way, either personally or through the medium of others. Nevertheless, let the ministers and custodians alone take special care through their spiritual friends to provide for the needs of the sick and the clothing of the others according to places, seasons and cold climates, as they judge necessary, saving always that, as stated above, they do not receive coins or money. Let those brothers to whom the Lord has given the grace of working work faithfully and devotedly that, avoiding idleness, the enemy of the soul, they do not extinguish the Spirit of holy prayer and devotion to which all temporal things must contribute. In payment for their work they may receive whatever is necessary for the bodily support of themselves and their brothers, excepting coin or money, and let them do this humbly as is becoming for servants of God and followers of most holy poverty. Let the brothers not make anything their own, neither house nor place nor anything at all. As pilgrims and strangers in this world (cf. 1 Pet 2:11), serving the Lord in poverty and humility, let them go seeking alms with confidence, and they should not be ashamed because, for our sakes, our Lord made Himself poor in this world (cf. 2 Cor 8:9). This is that sublime height of most exalted poverty that has made you, my most beloved brothers, heirs and kings of the Kingdom of Heaven, poor in temporal things but exalted in virtue (cf.Jas2:5). Let this be your portion that leads into the land of the living (cf. Ps 142:6 [V141:6]). Giving yourselves totally to this, beloved brothers, for the name of our Lord Jesus Christ never seek anything else under heaven. Wherever the brothers may be and meet one another, let them show that they are members of the same fmily. Let each one confidently make known his need to the other, for if a mother loves and cares for her son according to the flesh (cf. 1 Thes 2:7), how much more diligently must someone love and care for his brother according to the Spirit! When any brother falls sick, the other brothers must serve him as they would wish to be served themselves (cf. Mt 7:12). If any brother, at the instigation of the enemy, sin mortally in regard to those sins concerning which it has been decreed among the brothers to have recourse only to the ministers provincial, let him have recourse as quickly as possible and without delay. If these ministers are priests, with a heart full of mercy let them impose on him a penance; but, if the ministers are not priests, let them have it imposed by others who are priests of the Order, as in the sight of God appears to them more expedient. They must be careful not to be angry or disturbed at the sin of another, for anger and disturbance impede charity in themselves and in others. Let all the brothers be bound to have always one of the brothers of this Order as minister general and servant of the whole fraternity and let them be strictly bound to obey him. When he dies, let the election of his successor be made by the ministers provincial and custodians in the Chapter of Pentecost, at which all the ministers provincial are bound to assemble in whatever place the minister general may have designated. Let them do this once in every three years, or at other longer or shorter intervals, as determined by the aforesaid minister. If, at any time, it appears to the body of the ministers provincial and custodians that the aforesaid minister general is not qualified for the service and general welfare of the brothers, let the aforesaid brothers to whom the election is committed be bound to elect another as custodian in the name of the Lord. Moreover, after the Chapter of Pentecost, the ministers provincial and custodians may each, if they wish and it seems expedient to them, convoke a Chapter of the brothers in their custodies once in the same year. Let the brothers not preach in the diocese of any bishop when he has opposed their doing so. Let none of the brothers in any way dare to preach to the people unless he has been examined and approved by the minister general of this fraternity and the office of preacher has been conferred upon him. Moreover, I admonish and exhort those brothers that when they preach their language be well-considered and chaste (cf. Ps 12:7; 18:13) for the benefit and edification of the people, announcing to them vices and virtues, punishment and glory with brevity, because our Lord when on earth made ‘a short word’ (cf. Rom 9:28). Let the brothers who are the ministers and servants of the others visit and admonish their brothers and humbly and charitably correct them, not commanding them anything that is against their soul and our Rule. Let the brothers who are subject, however, remember that, for God’s sake, they have renounced their own wills. Therefore, I strictly command them to obey their ministers in everything they have promised the Lord to observe and which is not against their soul or our Rule. Wherever the brothers may be who know and feel they cannot observe the Rule spiritually, they can and should have recourse to their ministers. Let the ministers, moreover, receive them charitably and kindly and have such familiarity with them that these same brothers may speak and deal with them as masters with their servants, for so it must be that the ministers are the servants of all the brothers. Moreover, I admonish and exhort the brothers in the Lord Jesus Christ to beware of all pride, vainglory, envy and greed, of care and solicitude for the things of this world (cf. Mt 13:22; Lk 12:15), of detraction and murmuring. Let those who are illiterate not be anxious to learn, but let them pay attention to what they must desire above all else: to have the Spirit of the Lord and His holy activity, to pray always to Him with a pure heart, to have humility and patience in persecution and infirmity, and to love those who persecute, reprove and censure us, because the Lord says: Love your enemies and pray for those who persecute and calumniate you (cf.Mt5:44). BIessed are those who suffer persecution for the sake of justice, for theirs is the kingdom of heaven(Mt 5:10). But whoever perseveres to the end will be saved (Mt 10:22). 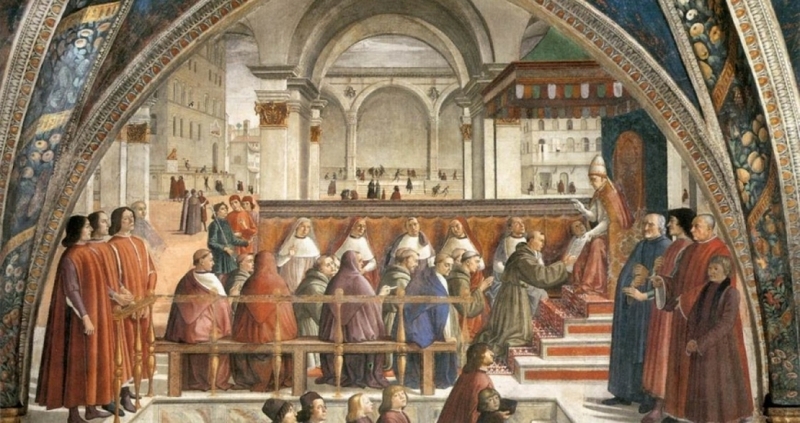 I strictly command all the brothers not to have any suspicious associations or conversations with women, nor to enter the monasteries of nuns, excepting those brothers to whom special permission has been granted by the Aposto1ic See; and not to be godfathers to men or women that scandal may not arise among the brothers or concerning them because of this. Let those brothers who wish by divine inspiration to go among the Saracens or other non-believers ask permission to go from their ministers provincial. The ministers, however, may not grant permission except to those whom they see fit to be sent. Finally I command the ministers through obedience to petition from our Lord the Pope for one of the Cardinals of the Holy Roman Church, who would be the governor, protector and corrector of this fraternity, so that, being always submissive and subject at the feet of the same Holy Church and steadfast in the Catholic Faith, we may observe poverty, humility and the Holy Gospel of our Lord Jesus Christ as we have firmly promised. It is forbidden, therefore, for anyone to tamper with this decree which we have confirmed or rashly dare to oppose it. If anyone presume to attempt this, let him know that he shall incur the anger of Almighty God and of His blessed Apostles Peter and Paul.